As I was sat thinking about how I was going to construct a page on the history of Greenheyes Farm, It occurred to me that it would be interesting to also research the history of the Smallwood family. As with the archaeological history of the farm the field of genealogy is not something that I can claim to have any real working knowledge of, So please be patient with me as I blunder through. This is an extract from inside cover of our family Bible. It gave me some idea as to where to start. Apart from the obvious starting point of my immediate family, I was fortunate to be in possession of the family bible. Inside the front and back cover had been recorded the names (although not all by far) of family members. 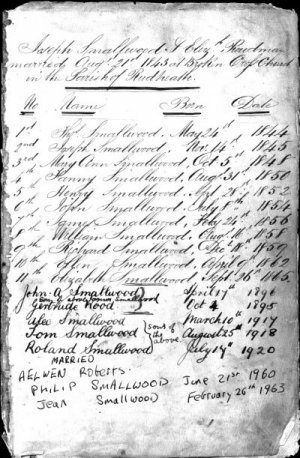 After a careful perusal of the available names and dates I found that I could create the skeleton for a family history dating back to 1774 to one Mathew Smallwood. Now the hard work, I have to try and put some meat on the bones. SEE BELOW you will notice that there are many gaps for me to fill. I hope to have information on my wife's side A.S.A.P. Matthew Smallwood b. 0 ___ 1774, d. 16 Jan 1865.I. Elizabeth Smallwood b. 2 Aug 1794, d. 30 Jan 1865. II. Matthew Griffith Smallwood b. 7 Jul 1814, d. 1 Feb 1887. III. Thomas Smallwood b. 16 Aug 1816. IV. Francis Smallwood b. 13 Apr 1819. V. Joseph Smallwood b. 9 Jun 1829, m. 21 Aug 1843, in Broken Cross Church, Rudheath, Cheshire, Elizabeth Proudman, b. 11 Jun 1822. A. Thomas Smallwood b. 24 May 1844, Middlewich Cheshire, m. Alice ?. 1. Thomas Smallwood b. c 1872, Altrincham Cheshire. 2. Henry Smallwood b. c 1873, Altrincham Cheshire. 3. John Smallwood b. c 1875, Altrincham Cheshire. 4. Joseph Smallwood b. c 1878, Altrincham Cheshire. 5. Tom Smallwood b. c 1879, Altrincham Cheshire. 6. William Smallwood b. c 1881, Altrincham Cheshire. B. Joseph Smallwood b. 14 Nov 1845, Middlewich Cheshire, m. Mary ?. 1. Ernest B Smallwood b. c 1873. 2. Joe B Smallwood b. c 1878, Over Cheshire. C. Mary Ann Smallwood b. 5 Oct 1848, Middlewich Cheshire, m. James Dickenson, b. ? ___ 1846. 1. Jane Davis Dickenson b. c 1870, Middlewich Cheshire. D. Fanny Smallwood b. 31 Aug 1850, Middlewich Cheshire, m. Richard Taylor, b. ? ___ 1847. 1. Mary E Taylor b. c 1876, Middlewich Cheshire. 2. William Taylor b. c 1879, Middlewich Cheshire. E. Henry Smallwood b. 28 Sep 1852, Middlewich Cheshire, m. Isabella ?. 1. Ada Smallwood b. c 1879, Middlewich Cheshire. F. John Smallwood b. 8 Jul 1854, Middlewich Cheshire, m. Martha ?. 1. Fred S Smallwood b. c 1878, Ashton Lancashire. 2. Elizabeth Smallwood b. c 1879, Wharton Cheshire. G. James Smallwood b. 24 Feb 1856, Middlewich Cheshire, m. Lydia ?. James died 15 Mar 1928. 1. Christopher Thos Smallwood b. c 1880, Middlewich Cheshire. 2. John Smallwood b. 17 Apr 1896, m. ___ 1916, Gertrude Wood, b. 4 Oct 1895.
a. Alec Smallwood b. 10 Mar 1917.
b. Tom Smallwood b. 25 Aug 1918.
c. Roland Smallwood b. 17 Jul 1920, m. 1959, Aelwen Roberts, b. ___ 1928. (1) Philip Smallwood b. 21 Jun 1960, m. ___ 1983, Dorothy Margaret Hough, b. ___ 1959, (daughter of Tom Hough and Muriel Buckley). (a) Simon Tom Smallwood b. ___ 1987. (b) Sarah Margaret Smallwood b. ___ 1989. (2) Jean Smallwood b. 26 Feb 1963. H. William Smallwood b. 16 Aug 1858, Middlewich Cheshire. I. Richard Smallwood b. 18 Dec 1859, Middlewich Cheshire. J. Ellen Smallwood b. 9 Apr 1862, Middlewich Cheshire.